Although there are no new pictures with this new information, nevertheless first I will state my overall conclusions with that info: That this Egyptian limestone statue head of Cleopatra VII (as the goddess Isis) had been reworked (including it's miniature art) as a de facto Damnatio Memoriae of Cleopatra (an unofficial damnation of the memory of Cleopatra), and also of Marc Antony's defeat, but also "perhaps" a suggestion of a minor redemption for Antony. It is pretty much accepted by most Roman historians that Octavian (who later was titled Augustus) despised the Egyptian cult of Isis. The reworking with this had been created for Legionaries occupying Egypt as a votive to their two "Dux Dummviri" (evidently two Roman Special Generals with legal authority) but overall to Octavian for his triple Triumph in 29 BC. Although somewhat disguised the extremely large letters on top of the statue (seen on oval of the lion's mane that will be identified shortly) reads "CLEO" (Cleopatra"), then also "OCT" ("Octavius"), then "G" ("Gaius") and finely"CS" (Caesar"), there are various smaller letters that have "CLEO" and variations of "MARC ANONIVS"'s ("Marc Antony's") name in abbreviations.. There is also a mention of the Roman Senate and possibly the Roman goddesses Ops and Trivia. Among other things when seen at a certain angle the lips on this statue head are sewn together with five stitches suggesting silence from Cleopatra. When seen slightly looking down at the statue at three angles from left to right it shows a Roman male face, what appears to be the face of Octavian from a frontal view, then another Roman male face from the right. This should be Octavian and evidently the two Generals for his Egyptian expedition, or the two Generals that he had appointed to govern Egypt. There are suggestions that the remains of Cleopatra and Antony had been placed in a temple of Isis, that the temple had Doric columns and that it had been on a hill top by the sea or by the Nile. It appears that Antony's remains had been cremated with his ashes having been placed in a jar, then the jar having been placed in what appears to have been an ordinary cinerary box and cover. The statue head is 17.3 cm in height and apparently had been chiseled off a statue. The entire artifact is engraved with miniature art, some of this is done with hardened clay (most likely mixed with a resin), there is also a small amount of paint (including two bits of red paint mixed with resins that gloss) and a bit of lead wash on the nose. 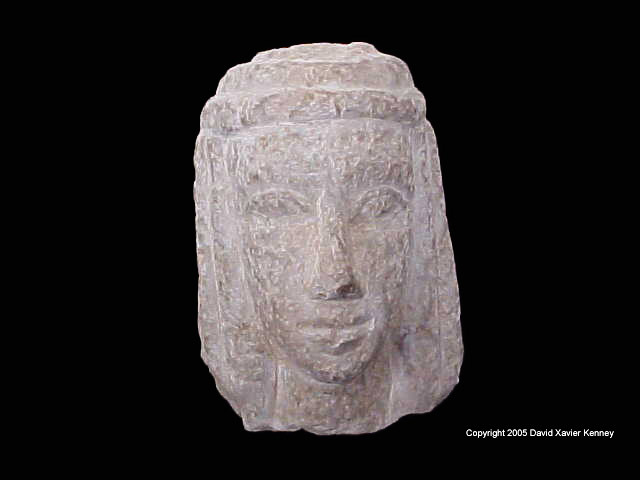 This artifact was purchased from a dealer in NYC as a limestone statue head of Cleopatra VII in 2005, it is from Egypt and with all the required export and customs paperwork. 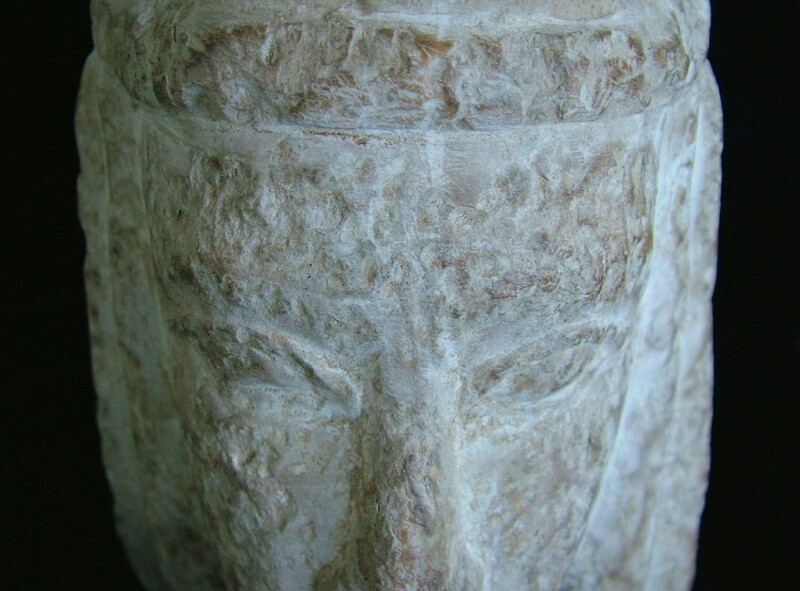 This first two pictures with the group of pictures shows the statue head's front and back. A few pictures for at least some of the above info. will be provided soon. The rest of the pictures are of the statue head's top and some of the details. On the top there is the following when seen from the right angle that is an upside down three ringed drinking or offering cup, the bottom ring is a type of watery didiam, the middle ring is a serpent eating it's tail (the Ouroboros ), and the top ring is an oval lion's main that has a serpentine dogs that meets a scene with several figures . As the cup is upside down being worn as a cap and due to some of the symbolism that will be explained then it is no doubt a mockery of Egyptian alchemy. This may suggest that it mocking the famed "Chrysopoeia (Gold Making)" of Cleopatra that although it is only known from a 10th C. AD it is thought to have been copied from manuscript that was circa 100 AD, but what is most important is that it suggests that Cleopatra was a known alchemist. The Ouroboros drawing of the Chrysopoeia of Cleopatra is one of the oldest images of the Ouroboros to be associated with the legendary philosopher's stone of the alchemists. When seen from a short distance the nose and carving on the forehead makes a distinct hammer type Tau cross that's vertical arm is widened at the bottom (most likely representing a hammer and a tree, as in a crucifixion?) that among other things has a crocodile head with it's mouth tied shut, this may hint at something to due with the serpent of the overhead Ombrous. Over this is a line. There is also a Latin type cross and then a type of two-barred Tau cross. If the oval part on the top (the lion's mane) is part of this then this could also be seen as the "Ankh" the cross with an oval loop on top and the Egyptian symbol of eternal life, but yet as the oval is detached from the cross then it should have an opposite meaning. On the top on the lion's face there are the very large letters that read "DM", I have no doubt that this is for Damnatio Memoriae. Then with this there are large legionary bind letters/numbers that read "DUX" but also "DVM", this should be for "Dux Dummviri" as mentioned before two Roman Generals sharing power as the military governors of Egypt. These also read as "LEG". Then all or some as these legionary numbers; "V", then "X", then "XIII", then "XV", then "XVI", and finely "XVII". The number "XVI" is most distinct suggesting that Octavian's 16th Legion had somehow more distinguished itself either in the battle for Egypt or in it's occupation, or perhaps this was due to a prior accomplishment of that legion or it's symbol, with this it known from later artifacts that Legion XVI Gallica's symbol was the lion, but then this is also the same with Legion XIII Gemina. This group of pictures is of the detail on the face. The forehead appears to have a scene of a sea battle, it most likely is of the Battle of Actium. Each eye has a different scene. On the nose there are various figures, on the left nostril there is excellent micro art of Octavian, Antony, and Cleopatra; unfortunately any photography of these works is not possible at this time, this is due to the extreme blurring caused by various minerals. The right front hair braid has the vertical Roman letters "S C V", but they are also made to be seen as "G C V". This abbreviation stands for Senatus Consultum (the Roman Senate) Victorious, but also for Gaius Caesar (Octavian) Victorious. On the throat there are blurred letters and letter/figures that show a "C', an "E" that is also an "L", an "O", and a "P". Although not seen here when these letters are viewed at a different angle and combined with figures they can also read as Caesar and Ops. The engravings on the bottom of the statue's head appear to have symbols of the defeated Egyptians. A large inscription on the bottom shows that it was dedicated by Legion III P, what the "P" stands for is unknown, but it most likely the legion that became III Cyrenaica, what is known is that a Legion III defected from Antony to Octavian, it is assumed that it was at some point titled as Cyrenaica.